WRN-EP is recommended for the general maintenance of wire rope. It provides corrosion protection and lubrication for standing and running rigging, drag lines and bridge cable. WRN-EP provides higher resistance to water abrasion and washout when used in tidal areas. Extreme pressure properties provide excellent lubrication for both wire rope and open gear applications. Permanently soft gel with extreme pressure properties. Rusty wire rope and cable should be first treated with FLUID FILM® Liquid A or Liquid AR, to attain maximum penetration. During the manufacture of new wire rope, it is recommended that the strands be first saturated with FLUID FILM® Liquid A, with the finished rope being sealed with WRN-EP, Wire Rope Dressing. 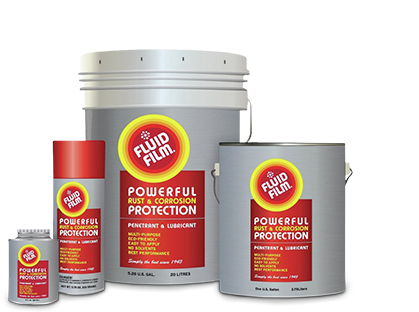 Where a low viscosity material is desired for a slushing compound, the use of FLUID FILM® Gel WRL is recommended. This product also has extreme pressure properties. See Technical Bulletin #206.2. WRN-EP Wire Rope Lubricant may be applied using a leather or lamb's wool glove. When a considerable length of wire is to be coated, it may be advantageous to apply as follows: Form a cone of leather, about two feet long and six inches in diameter at the base. Both base and apex are left open with the wire rope passing through the apex. The apex is tightly lashed around the wire with marlin for about six inches. WRN-EP is applied to the wire with a rag, then the leather cone is dragged along the wire (or vice versa) so that the excess is scraped off into the cone, the remainder being well worked into the rope crevices. The amount of material left on the wire can be regulated by adjusting the marlin lashing. Too heavy an application not only wastes material but also can result in throw-off, particularly in running cable. Packaged in 41 pound pails and 456 pound drums. All components of FLUID FILM® WRN-EP are listed on the TSCA Inventory.